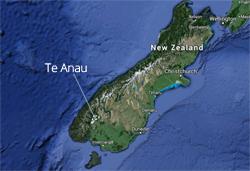 Fiordland is an anglers delight for trout fishing, and many Te Anau and Manapouri residents and visitors are keen freshwater sports anglers. Fiordland's rivers and lakes are well-stocked with brown and rainbow trout, and there's some great fishing in Lake Te Anau and Lake Manapouri, and on the shores of these lakes, and in the river Waiau that connects the two lakes, and other local rivers such as the Upukerora, which flows into Lake Te Anau just north of the town. Average trout sizes range from 1.5kg to 2 kg, but larger brown trout may exceed the magical 10 lbs. The mix of rainbow and brown trout depends on the habitats available to them in particular locations. NZ prides itself on our rivers and lakes being public waters. Consequently, there is a huge variety of river fishing available, from remote rivers in amongst our western mountains, to gentle streams only minutes from Te Anau. Fiordland's large deep lakes of Te Anau and Manapouri provide boat trolling, stream mouth, and shore fishing opportunities. Our largest river, the Upper Waiau, between lakes Te Anau and Manapouri provides highly productive fishing for the rainbow trout that dominate its water. Fish and Game maintains angler access points so you can be confident in getting to them. Access brochures with maps are readily available at outdoor sports outlets, such as Fiordland Frontier, on The Lane in Te Anau, near the cinema. A great place to find out locations where you are allowed to fish in Fiordland is the Department of Conservation's web page on fishing in Fiordland. There is the option of being guided by experienced local anglers, who can also provide fly fishing tuition. 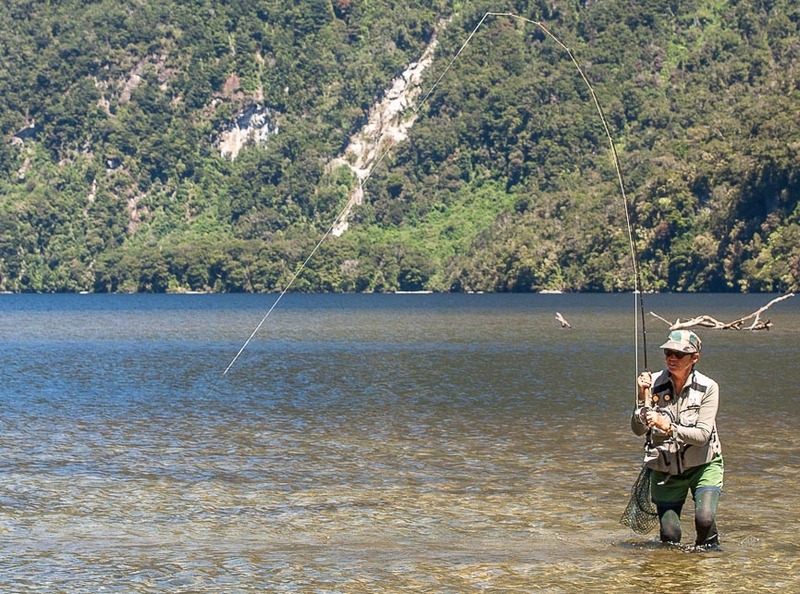 For example, Fiordland River Guides and Fiordland Lodge provide guided fishing. Guided fishing from jet boats by FishJet is also available (including for families). More information about local guides can often be found by talking to staff in Fiordland Frontier or Outside Sports. The new licence year begins 1st October. Some rivers open on that date, but most lake tributary rivers and streams open on 1st November 1 to protect spawning fish. It is important to have your fishing licence, and comply with the regulations you are provided with when you buy your licence. Go to fishing regulations here. Fishing without a licence is illegal. For fishing licence information, including buying your licence on line, go to the Fish & Game website. Licences for kids under 12 are free, and there are reduced costs for young people up to the age of 17. Family licences are also popular. Take a kid fishing and give them an interest for life. If you want to give the kids an introduction to trout, visit the Trout Observatory in Te Anau. It's just opposite the Department of Conservation's Fiordland visitor centre, near the lake front to the south of the main street. There is a fantastic fishing competition, the Fishing Classic, held in Te Anau annually in the spring (over Labour weekend), which also has a kids section; another opportunity to get kids into a fantastic sport and out into nature. Go to our Fishing Classic page to find out more. All vessel operators and anglers planning to visit the Fiordland marine area have a role to play in keeping Fiordland as beautiful below water as it is above. Freshwater pests can spread by a single drop of water or weed fragment. With your help, we can stop freshwater pests like didymo and lagarosiphon from spreading and keep our waterways pest free. 1. Keeping your vessel's hull and marine equipment clean and free of fouling. 2. Making sure you have a good, thorough and functioning antifoul coating. 3. Cleaning and air-drying any marine equipment and boats to be used in Fiordland waters e.g. ropes, pots, fishing gear, kayaks and tenders. For further information visit the biosecurity website. If you suspect that you have seen a marine plant or animal that is new to Fiordland, please phone 0800 80 99 66. Check, Clean, Dry everything that been in contact with the water when you move between waterways. Some requirements are in place for specific recreational activities - check the Department of Conservation website for more information on Clean Gear Certificates and other requirements.